Both of the U.S. Open women's semifinals took place yesterday, although only one of the match ups was difficult to predict beforehand. Serena Williams not-so-shockingly won her match against the overwhelmed Sara Errani, but before that, Victoria Azarenka and Maria Sharapova, the No. 1 and 3 seeds, were locked in a tense battle for a coveted spot in the final on Super Saturday. Azarenka might have been initially stunned by playing in her first U.S. Open semifinal, but she eventually eased into auto drive, pushing the shaky Sharapova to three sets and claiming victory after nearly three hours. The first set, however, was less than enthralling. At the onset, Azarenka was out of sorts, barely capable of constructing points. She dropped her first two service games, both with a double fault at break point. Sharapova would do the exact same thing later though, and she again struggled mightily with her serve when trying to close out the set at 5–3. Amusingly, she capitalized on her second set point with an ace. Act two was instantly more competitive, with Azarenka now managing to tap into her characteristically deep, consistent groundstrokes and sharp angles. Despite already having a set under her belt, Sharapova conversely looked extremely unnerved by the errors she was making, usually in response to Azarenka's defense. The top seed took the second set. Throughout the third, Azarenka put significant pressure on Sharapova's serve, making each and every hold an individual battle that Sharapova, impressively, met with intensity. But while serving at 4–5, it all became too much. Sharapova saved one match point, but Azarenka claimed the second by forcing an error from her opponent, securing her spot in the final. In the third set alone, Azarenka managed to hold by playing just 29 points on her serve, while Sharapova was forced to play 56 during her service games — a testament to the top seed's aggressive play. Before this match, Sharapova was 12–0 in three-setters for 2012. The Belarusian, herself now at 12–0 this year, fed Sharapova her first such loss. 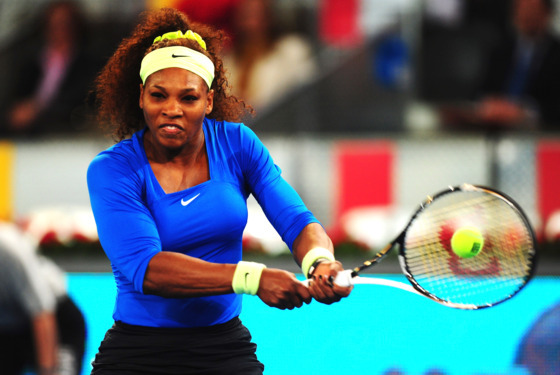 Azarenka will play Serena Williams in the final this evening, since Williams handily beat Sara Errani in straight sets. ("What a surprise!" said absolutely nobody.) Williams had a bumpy ride back from injury last year, but since her win at Wimbledon, she has been in astonishing, focused form. Errani meanwhile worked extremely hard to reach the semifinal to play her, taking out Angelique Kerber in the fourth round with her Ferrer-like defense and determination, but she really had no chance against the younger Williams sister. Although Azarenka's 9–1 head to head record against Williams doesn't inspire confidence that she can do much to hurt Serena's game, she has proven so far in this tournament that she has the confidence to come back from a deficit (vs. Sharapova) or patiently hold steady when seriously challenged (vs. Sam Stosur). Moreover, Williams has had a remarkably soft draw thus far, so whether she's actually prepared for Azarenka's aggression remains to be seen. The final begins tonight at 7 p.m., after the completion of the men's semifinals.